Building your own Solar Water Heating Panel is not beyond anyone with basic DIY/handyman skills, and no specialist tools or equipment are required. In this article we will look at making a basic but efficient and robust solar water heating panel using materials you can find at local builders merchants, or online, and common household tools. In this article we will give an overview of solar water heating panel design and construction, focussing on the component parts and the reasoning behind their selection. A solar water heating panel is a device through which water (or other fluid) is pumped being heated by the sun as it travels through the panel. 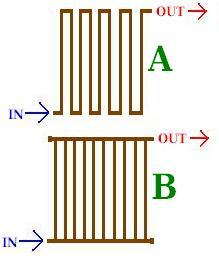 In some panels there is a long pipe which snakes through the panel up and down as it moves from left to right (A), but for the panel design discussed here we will take advantage of the fact that hot water rises (or cool water falls) so we can arrange the pipework in a way which is more sturdy and more efficient (B). If we were just to put bare pipework out in the sun, it would heat up the water passing through it, but a lot of heat would be reflected and radiated away. To avoid this, the pipework needs to be fitted into an insulated box with a clear front so that the sun’s rays can pass through the front, and even if the light bounces off the pipework, its energy can still be absorbed and held in the box. Think about how hot the interior of a car gets when parked in direct sunlight. We want our pipework to be surrounded by this type of retained heat to increase the heating effect on the water passing through the pipes. And that is about it; that is all a basic solar water heating panel is – some pipework in an insulated glass fronted box. Deciding what size solar panel to make is tricky. Rather than picking an arbitrary size, it is better to let the availabilty of the necessary component parts dictate the size to you. For example, if you can get your hands on a piece of toughened glass of a certain size free of charge, it would make sense to build the panel around the dimensions of that glass. 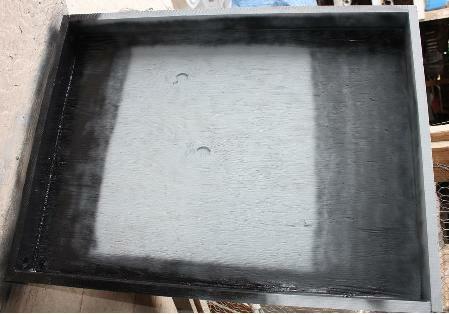 Inside the panel will be an absorber plate made of sheet aluminium. If you do not have the necessary tools to safely/tidily cut aluminium sheet, it would make sense to select panel dimensions which mean you will not need to cut the sheet or sheets of aluminium. Similarly, you ideally want to minimise copper pipe waste, so if you purchase pipe in 2 metre lengths, you would want to design your panel with runs of 1 metre, 66cm, or 50cm for zero waste, and not 70cm since that would result in 60cm of waste from each pipe. Sizing the panel in terms of your location, hot water consumption, and tank size is tricker. It is much easier to install multiple solar water heating panels rather than just one large one because they start to get very heavy and difficult to mount as they get bigger. This also has the benefit that in the colder months you can connect multiple solar panels in series – so heated water from one panel is further heated by the next, and so on – and then connect them in parallel in the summer months for maximum efficiency. If you are just starting off, make a panel and see how you get on. The pipework needs to be completely enclosed in an insulated box to maximum efficiency. An example of such a box is pictured above. It is simply a wooden frame screwed onto a backing sheet of marine plywood, or any other material you can find which is strong and can be treated or painted to keep out the rain. Treat or paint all of the timber now while it is all accessible and easy, and then fill any gaps with heat resistant silicon sealant so that the finished box will be air-tight (and therefore retain the heat). 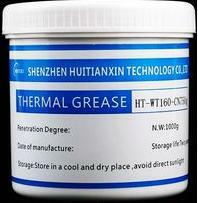 Hammerite make some good long lasting products for painting and treating exterior woodwork. The box must now be lined with insulation. Any heat resistant insulation will do, but the cheaper it is, the more space it will take up and therefore the deeper the box you will need to make. Therefore we suggest you use multi-foil insulation which is designed for use by roofers (it goes under the waterproof membrane which is in turn underneath the tiles). 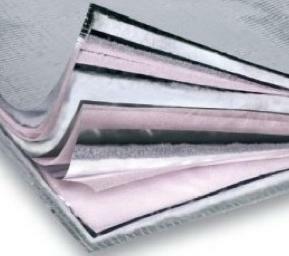 This offers excellent insulation qualities, the foil reflects heat back into the panel really well, and it is very thin and easy to use. In order to increase the solar absorption of the solar collector, the pipework should be fixed to a metal sheet – copper would be best, but it would be expensive and heavy, therefore aluminium is usually used. This absorber plate acts as a heatsink absorbing energy from the sun’s rays and then giving it to the water passing through the pipework heating it up. The absorber plate cannot be too thin or it will bend and warp when it is heated, and it cannot be too thick or it will be too heavy, expensive, and less efficient. The ideal thickness has been found to be around 1.5mm which corresponds to the common standardised metal sheet thickness of 16 SWG. You may struggle to find a sheet of the same size as your solar panel, but multiple small sheets can be used together. The absorber plate should be primed and painted with heat resistant black paint on both sides to maximise its heat absorption and reduce its reflectivity. The absorber plate must now be fitted into the box. Ideally it will not just lie directly on top of the insulation crushing it (and therefore making it less efficient). Instead mount it on brackets or to small wooden piers which pass through the insulation so that when fitted there is no air gap between the back of the absorber plate and the insulation, but the insulation is also not being compressed by the plate. Copper pipe is almost always used in solar water heating panels. Copper transfers heat very well – think very expensive pans – it is available from all plumbers and builders merchants, and it is relatively flexible. 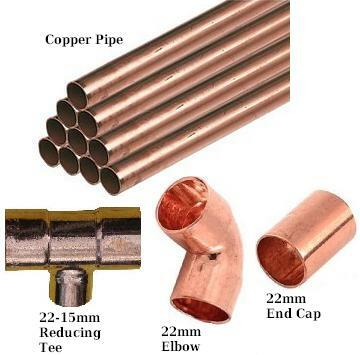 There are a wide range of connectors available for all sizes of copper pipe and these when soldered make very strong and reliable joints. Copper pipe is sold in packs of straight lengths or in coils. It is better to go for the straight lengths for this solar panels design as it is all straight lines. For the horizontal pipes along the top and bottom of the pipework use 22mm pipe, and for the verticals use 15mm pipe. You need a couple of 22mm end stops, and sufficient 22-15-22mm reducing tees (which join the horizontals to the verticals) to complete the panel of the size you want. Cut the pipes to the lengths you would like and put everything together to make you you have sized it correctly; then you need to permanently solder all of the joints. See our guide for details on How to Solder Copper Pipe. With the pipe array complete, prime and paint it all over with heat resistant black paint. 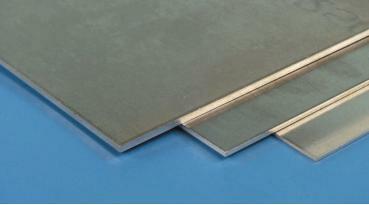 The copper pipe array must be fitted securely to the absorber plate. The pipework should be in contact with the absorber plate as much as possible to maximise heat transfer and efficiency. One way to achieve this is to lie the pipe array on the absorber plate and drill small holes in the plate either side of the pipework in around 10-15 positions around the array. Feed 15-20cm lengths of strong uninsulated solid wire over the pipe and through each pair of holes and twist the wire ends together on the other side. Before going around and tightening the wire twists as tight as they will go, spread heat sink compound (aka thermal compound) on the underside of all the pipework. When you do the final tightening of the wires, the pipe array will be pulled against the absorber plate and the heat sink compound will aid heat transfer. When you have tested your solar panel very carefully to ensure that there are no leaks or other problems, it is finally time to seal the whole thing up permanently with a sheet of glass. While it is possible to use clear acrylic or other types of clear plastic, these materials tend to become milky/foggy over time, they are hard to clean well, and they scratch easily. Though more expensive, and heavier, glass is the best option for the front of a robust solar water heating panel. As with the absorber plate, the thickness of the glass is very important. Thin glass is weak and will not be able to support its own weight on a large panel, but it lets through lots of sunlight with low reflectivity. Thick glass is strong, but also heavy, and every additional mm of thickness of glass increases the reflectivity and therefore reduces the amount of sun getting through it. The ideal thickness is around 4-5mm. The glass should be sealed to the box using heat resistant silicon sealant, and then use wooden beading around its edges to protect them and reduce the chance of water getting in. 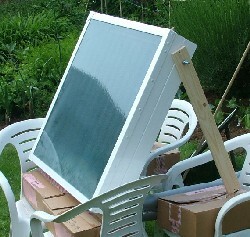 If this article has whetted your appetite for more information, a good starting point is our article DIY Solar Water Heating Prototype which shows the construction and testing of a solar water heating panel of the type discussed above together with making a heat exchanger to use the panel for indirect heating. Click here for our article on Direct Solar Water Heating (with pump), and here for the article on Thermosyphon Solar Water Heating (without pump). 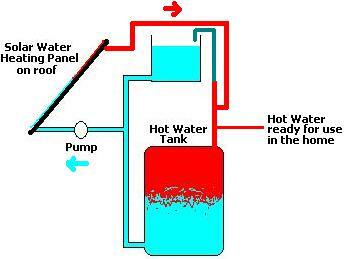 Those articles cover the simplest solar water heating systems to put together using your panel.